It’s Friday and I’m feeling random – here we go! “Carry-on” is a joke. Everyone carries a bag the size of a couch + at least one more thing. People smell. Most don’t mean to, some don’t care, but you just can’t jam that many people into such a tight place without experiencing breath that smells like a goat’s toenail. Babies cry on planes, their ears hurt, getting huffy about it doesn’t get us there any faster. More people, more noise. Everywhere. Inescapable. Visitors form a kinship with each other – in the nation’s Capitol the first tip-off are all the name badges, the second are that the people wearing them are the only ones visiting with each other, the “regulars” buzz by in a blur. Everyone has a story to tell; this week I traveled with a middle-aged lady and an elderly dog, an excited young family, a new father with a shared 4-H background, and an older gentleman with an elegant chapeau. Humanity, gotta love it. On the flight to Michigan, someone holding up their hand to point to where they’re from. Smiling. Home again. And how was your week? Any randoms to share? Sounds like you had a whirlwind trip. I know you’re glad to get home to that brown-eyed handsome man! All this talk about flying reminds me that I need to sit down with Hubby and decide on our summer travels. We will be visiting family in Maine and Tennessee, but need to finalize dates and buy plane tickets while there are still seats available. I got over to a beautiful display garden of tulips and other spring bulbs, and need to finish going through (and editing) the photos to create a post of them. Have a great weekend! 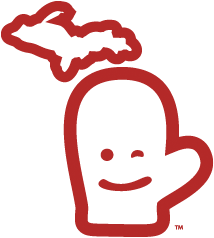 The Mitten. Yep, still use the visual to show/tell people where we lived for seven of the 17 years we lived in the Midwest. I love it. I can sorta do it with the state of Idaho and my hand but it just doesn’t have the same effect. Quite a variety of traveling companions. Isn’t it wonderful we aren’t all alike?